Yogasmith Portsmouth opened in January of 2009 in the historic downtown building at 16 Market Square (above Breaking New Grounds coffee shop). We may have a soft spot for the domed ceilings and original floors that give this studio its personality and character. Enjoy yoga with the sun shining in the huge windows overlooking Daniel Street and Market Square. 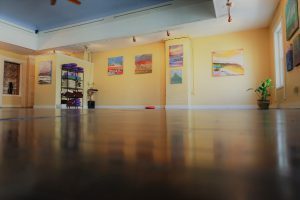 Yogasmith Exeter opened in the fall of 2011 in downtown Exeter at 175 Water Street. The old brick “Smith” building provides a gorgeous view of the Swasey parkway and Exeter River. 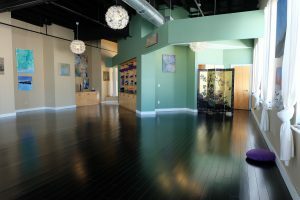 With bamboo flooring, high ceilings, and two walls of windows, the space provides a calm and open studio for practice all hours of the day. Yogasmith Dover opened in 2012 at 1 Webb Place. 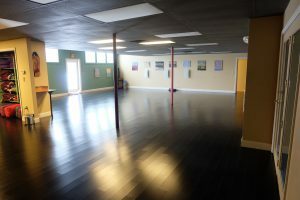 This is our largest practice space with over 1800 sq feet of studio space for class practice. The studio is easily accessible to many communities and commuters in the area. The space is warm with dark bamboo flooring and subtle lighting that keeps you comfortable and at peace throughout any class. NOW OPEN! 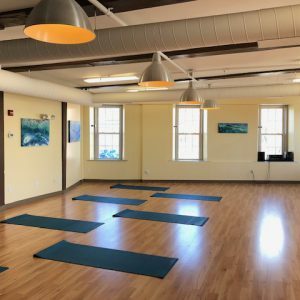 Yogasmith Amesbury opened in November 2018 in downtown Amesbury at 36 Main Street. This historic mill building adds to our existing studios by offering a practice space with ample windows and sunlight overlooking the river and downtown. This location is convenient from Exeter, Kensington, Newburyport, Salisbury, and other surrounding towns.